/ Modified aug 19, 2016 5:09 p.m. 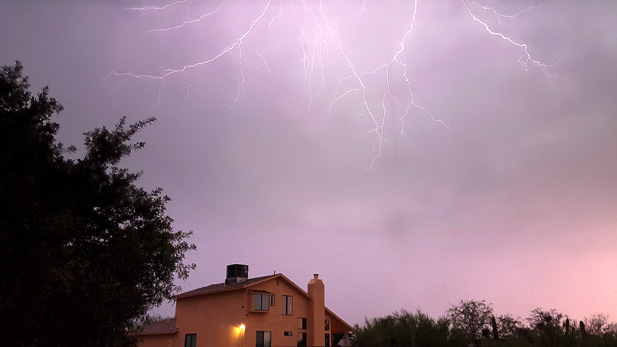 Lightning flashes over a house on Tucson's far east side during a monsoon storm. Southeastern Arizona's summer rainstorms have been strong so far this year, according to the National Weather Service's Monsoon Halftime Report and Season Outlook. “Most areas were at least normal or above normal, with parts of Cochise and eastern Pima counties receiving two to three times the normal amount of rainfall,” said NWS meteorologist Ken Drozd. Measurements at Tucson International Airport show the area received 4.89 inches of rain as of August 8, the midway point for the season. Some parts of Tucson received more than eight inches, while areas in Cochise County and the Santa Catalina Mountains received closer to nine inches. Conditions should return to normal for the rest of August, according to Drozd. “However, the outlook for September is for slightly better chance for above-normal rainfall, especially for Pinal, Graham and Greenlee counties,” he said. After that, forecasts call for average amounts of rainfall for the rest of 2016.